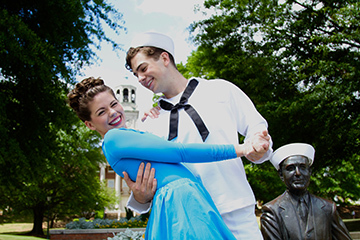 Samford University’s School of the Arts will present Leonard Bernstein’s lively musical On the Town April 28–May 1 in Harrison Theatre. A 50-member cast will perform the show’s impressive choreography and some of Bernstein’s most recognizable Broadway songs, including “New York, New York.” The show, which opened on Broadway in 1944 and was made into a film in 1949, tells the story of three sailors on a 24-hour shore leave in the Big Apple during World War II. Kristin Kenning, director of Samford Opera, put care into selecting the show that is one of the final productions during the 100 Years of Samford Arts observance. “We chose the show because Bernstein’s music is delightful, and the show is hilarious. Also, because it’s a very large cast, we could include a large number of School of the Arts students in the process of designing, rehearsing, building and performing the show,” said Kenning, who also is pleased that the show includes dance. In addition to a main cast that alternates between matinee and evening performances, performers include 22 singers in male and female ensembles, all accompanied by a 29-member orchestra. In a nod to traditions of that time, when the orchestra of every musical on Broadway played “The Star-Spangled Banner” before the curtain went up, Samford audiences will be asked to stand and join in singing the national anthem before each On the Town performance. The Friday, April 29, show is an exclusive performance for guests at Samford Legacy League’s eighth annual Scholarship Gala Celebration. The evening also includes a private reception in the art gallery at 5:30 p.m. and dinner on the Wright Center stage at 6:30 p.m. prior to On the Town. Proceeds will help provide need-based scholarships for students pursuing a degree from Samford’s School of the Arts. Legacy League Vice President for Membership Suzanne Hopkins is chair of the event. Individual tickets for the scholarship gala are $100–$125 ($50–$70 tax-deductible). For reservations and more information, go to samford.edu/legacyleague. “We are honored and thankful that the Legacy League is partnering with On the Town to raise School of the Arts scholarships,” Kenning said. The production, combining the talents of Samford’s Division of Music and Department of Theatre and Dance, is presented as part of the Dr. Chandler and Jane Paris Smith Opera Series. Show times, excluding the April 29 Legacy League performance, are 2:30 p.m. on April 30 and May 1, and 7:30 p.m. on April 28 and 30. Tickets are $6 for students and $15 for reserved seating. For information or tickets, call the Samford box office at 205-726-2853 or go to tickets.samford.edu.